Yesterday we brought you design ideas for adding luxury to your kitchen. Today we’re going to focus on living rooms. 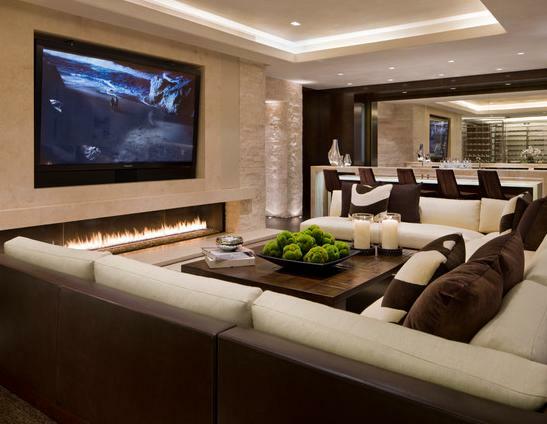 Like the kitchen, the living room is also a popular room for entertaining. It’s also however, the room you go to when you need to relax and unwind. So today’s luxury living rooms all contain elements to help you do just that. The combination of soft, warm lighting, tea light candles and fresh flowers brings a spa like feel to this living room seen on freshome.com. Although the décor is very simple, it is easy to add luxury with a few well-chosen accessories. Take a look at our selection of candles and allow yourself to unwind. We can’t all be lucky enough to enjoy such a stunning view as this one, seen on zillow.com. The good news is, it’s really easy to cheat your way into thinking you’re at the beach – paint a beach-like mural on one of your walls and turn your furniture to face it. And if that doesn’t work, you can always bring nature inside with an indoor garden. What could be better than snuggling up on a cosy sofa surrounded by the warmth from the fire and watching your favourite movie on a big screen? Make your television the focal point of the room like in this living room from houzz.com and invest in a u-shaped sofa so you have plenty of room to stretch out. Which luxury living room gets your vote? For more ideas about how you can introduce an element of luxury into your home, head on over to our Facebook and Twitter pages.